I am an organizer at heart and organizing my wedding is no different- I want things to go as smooth as possible. It can be super overwhelming with RSVPs coming in every day and I wanted to make sure to cover all my bases. 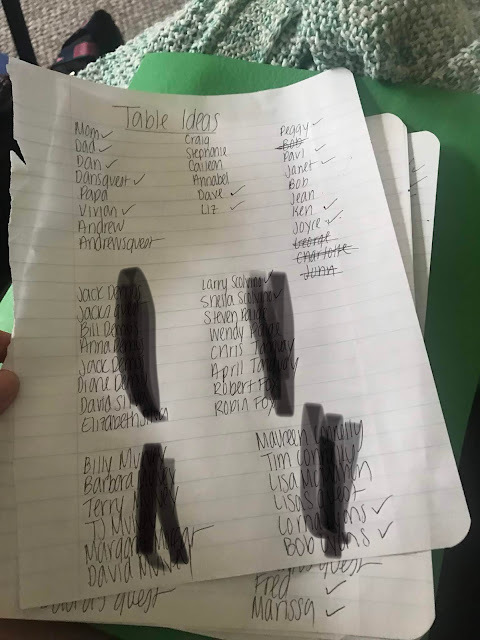 I wanted to make sure that I was able to keep track of everyone and also make sure that I already had an idea of table set up. I have a few ways I'm keeping track of everything and I'm going to share all of them with you today so hopefully it will help you when planning your big day! The first comes in the form of a green folder. 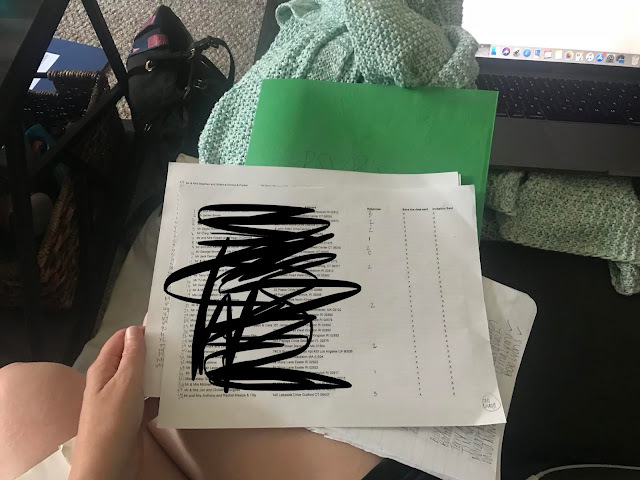 I have a spreadsheet that I've been using since we went out our save the dates. I kept track of each person I sent a save the date to, each person I sent an invitation to, and now I'm keeping track of their responses. I simply am putting a number in the second column to indicate how many people are coming. Having the numbers right there has been great for keeping an accurate count of guests. It also helps show me who has yet to respond. I also have this spreadsheet on Google Sheets which I'm able to access directly from my phone so it's super convenient. This paper is where I mapped out the tables. I made a plan on where I think everyone would be sitting based on my initial guest list. As people have said they aren't coming I've crossed them off and as people confirm I put a check next to their names. This way later on I will be able to combine smaller groups of people into larger tables and they will still be with people they know. Hopefully this will keep everything together so it's easier to finalize the lists when we get closer. In addition to these papers I am keeping a running list of guests along with a tally in the notes section of my phone. I also keep a list of song suggestions on my phone and the table groupings. Like I said- neurotic. Of course I am storing all these papers along with my wedding planning binder in my Bride tote that my MOH bought me! How did you organize all your guests?